New proposal calls for investment in domestic priorities but also prioritizes Pentagon spending and military force. Americans rightly expect certain things of our government: clean, safe drinking water and air, an education system that works, and a system that allows anyone to succeed. But those priorities aren’t always what we see if we look at our federal budget. Too often, we see a budget that benefits special interests at the expense of ordinary people. And more than half of discretionary spending is reserved for the Pentagon, war, and related costs. What’s more: about half of Pentagon spending has been captured by for-profit contractors. Meanwhile, proposals that would benefit Americans, like free community college, receive little or no consideration by our current Congress. President Obama’s final budget proposal calls for increased investment in education, the fight against climate change, and family-friendly tax policies, all of which enjoy broad popular support. However, it also calls for continued windfalls for the Pentagon that will benefit for-profit contractors without adding to our security. The president’s proposal calls for $4.2 trillion in federal government spending in 2017, representing a four percent increase over 2016 total spending. 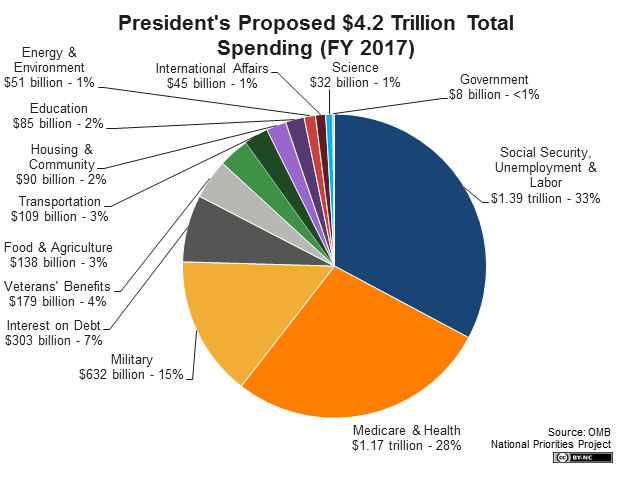 Of that, $1.15 trillion is for the discretionary spending budget that Congress legislates each year, and nearly $2.8 billion would be for mandatory spending authorized by existing law. Compared to 2016, discretionary spending would decrease in every category except veterans’ benefits and labor – including education, science and international affairs. Mandatory spending would increase by more than five percent over 2016, with the biggest increases in Social Security, transportation, and Medicare. Of the discretionary spending total, $622.6 billion, or 54 percent, would be set aside for the Pentagon, nuclear weapons and related items. The next biggest category of discretionary spending would be veterans’ benefits, receiving an additional $75.4 billion. These two categories total nearly 61 percent of the total discretionary budget. The remaining 39 percent would fund education, housing and community programs, science, the environment, and more. A clean transportation package totaling $32 billion per year over ten years that would create hundreds of thousands of middle-class jobs in an economy that still doesn’t provide enough opportunities for good-paying work. A strong education system is a clear prerequisite to a fair economy with equal opportunity for all. Americans consistently say that more investment in education is among their top priorities for our government. Two free years of community college, a federal-state initiative that would cost the federal government $61 billion over ten years – which the current Congress failed to take up last year. Increasing Pell grant funding by $2 billion, in stark contrast to congressional proposals to freeze or cut funding to the program for the lowest-income college students. Continuing support for the president’s signature Preschool for All program, a federal-state partnership that provides preschool support for the lowest income four-year olds. $4 billion over three years in new Science, Technology, Engineering, and Math (STEM) funding for K-12 education. The budget proposes to double clean energy research and development to a level of $12.8 billion by 2021. A $2 billion per year investment in cleaner vehicles and aircraft. 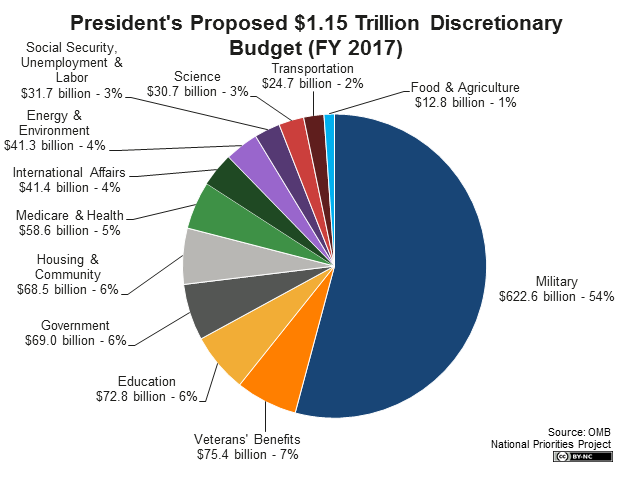 The budget maintains the status quo, with more than half of discretionary funding (the funding Congress allocates each year during its budget process) reserved for the Pentagon and spending on nuclear weapons and related items. Total Pentagon and related spending in the request amounts to nearly $623 billion, including the Pentagon budget, nuclear weapons and aid to foreign militaries. The budget provides $583 billion for the Pentagon alone in 2017, a $2 billion increase over 2016. Quadrupled funding, or $3.4 billion, for the European Reassurance Initiative, recommitting the United States to military involvement in a conflict where our ability to make a positive difference is highly questionable. The Pentagon budget is more than ten times the budget allocated for diplomacy under the Department of State, which is $52.7 billion in 2017. There are often effective alternatives to war, but we too often do not employ them. Compared to $7.5 billion for military efforts against ISIS, the budget provides just $4 billion for dedicated diplomacy and humanitarian relief around the region. The president’s budget proposes reforms to modernize the Unemployment Insurance (UI) program so that more workers are covered and for longer periods of time. Expanding UI’s federal extended benefits program to provide up to 52 weeks of additional federal benefits for states with higher than average unemployment rates. As in 2016, the president’s 2017 proposal would close loopholes that allow some high-income individuals to avoid Medicare and Social Security payroll taxes, which could provide as much as $10 billion more in revenue per year by the end of the decade. The budget also proposes certain reforms to the Medicare program that would extend the solvency of Medicare Part A - the Hospital Insurance trust fund - by an additional 15 years. The program is currently fully funded until 2030. The president’s plan would lower prescription drug costs under Medicare Part D and introduce a co-payment for beneficiaries who receive home health care services, among other reforms. 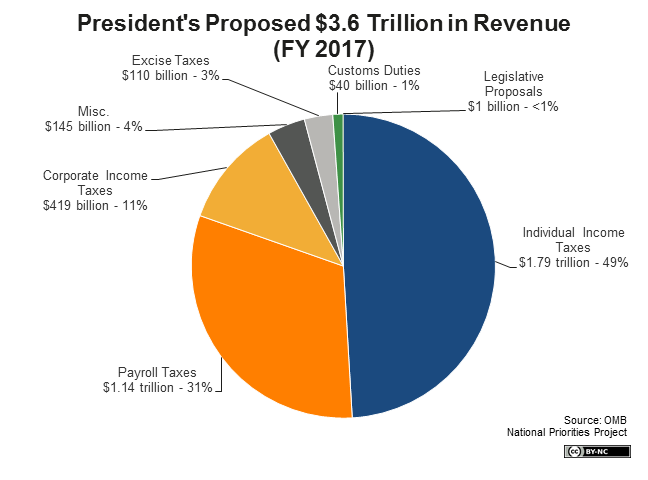 The president’s budget proposal projects $3.6 trillion in total tax revenue in fiscal year 2017, and includes proposals that focus on raising additional revenue and increasing fairness and transparency in the tax system. Many of these would be very popular among Americans, who believe the wealthy and corporations don’t pay enough in taxes. Implement the “Buffet Rule,” ensuring that the wealthiest Americans pay at least 30 percent in income taxes even after they’ve availed themselves of the numerous tax loopholes available to them. These reforms would make taxation on the wealthy more in line with the taxation of income earned by lower- and middle-income Americans. A new fee for large financial institutions – roughly 100 firms with assets of more than $50 billion – that would discourage excessive risk-taking and raise $111 billion over ten years in new revenue. Requiring companies to pay taxes on income earned abroad, which would prevent U.S. companies from “inverting,” a maneuver where American corporations arrange to be purchased by smaller overseas corporations to avoid paying U.S. taxes. The plan wouldn’t only raise more revenue. It would also use the tax code to combat economic inequality directly, by building upon improvements made to the Earned Income Tax Credit (EITC) under the American Recovery and Reinvestment Act (ARRA) to expand EITC benefits for childless workers. It would increase the size of the credit and provide the credit to more workers based on income and age. The president’s budget proposal would run a deficit of $503 billion in fiscal year 2017, down from $616 billion in 2016. The plan would achieve $2.9 trillion in deficit reduction over ten years from various health, immigration, and tax reforms, including $955 billion over ten years from closing certain loopholes for wealthy taxpayers. As a share of the economy, the deficit is projected to be 2.6 percent of the economy in 2017, down from a high of 10 percent in 2009 following the Great Recession. The president proposes to limit deficits to less than 3 percent of the economy over the next ten years, which is on par with recent history: over the last 50 years, budget deficits have averaged 2.9 percent of the economy. Federal law requires that the president submit a budget proposal to Congress every February, which serves as a starting point for negotiations in Congress. The proposal begins the annual federal budget process that creates the budget for the coming fiscal year, which begins on Oct. 1. For more on who decides the federal budget, see Federal Budget 101. Though the budget ultimately enacted by Congress may look very different from the budget request released by the president, the president’s budget is important. It’s the president’s vision for the country in fiscal year 2017 and beyond, and it reflects input and spending requests from every federal agency. At a time of conflict over federal spending, the president’s budget is largely a political document – but an important one, because it shows the president’s priorities in detail. It also serves as a benchmark against which all subsequent spending legislation will be measured.